Typical modern gas station architecture centers on a simple design principal—uniformity. A Shell station in Seattle looks like one in Savannah. Switch a Texaco station from Tuscaloosa with one from Tallahassee and no one would know the difference. But gas stations used to be unique, none more so than a small, one bay building in Lamar, Colorado a small town in southeastern Colorado. 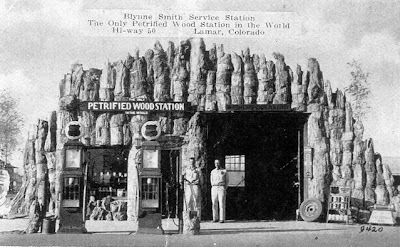 Built in the 1930s by William “Bill” Brown, the station was made entirely of petrified wood that Brown stole from private land. Brown’s petrified wood began life 125 million years ago on a relatively flat, semi-arid landscape that tilted down to a coastal plain to the east. North America was located a bit south of its present location but a sea had begun to move in from the north, which by 85 million years ago had split the continent into two massive islands. Large streams flowed out of nearby hills, crisscrossed flood plains, and removed most plants and animals that could have fossilized except for trees, some of which are now found in the gas station. Only three month’s after the Brown’s station opened, Ripley’s Believe It or Not! mentioned it in a column. 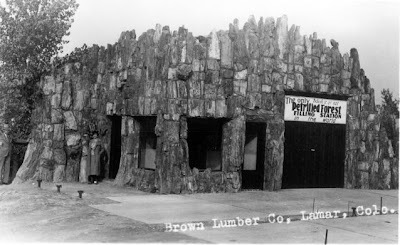 The caption read “The Petrified Wood House, Built Entirely of Wood Turned to Stone.” Brown had a sign made with this caption and placed it on the front of the station. Brown’s gas station also interested Frank Phillips, the founder of Phillips Petroleum, the type of gas that Brown sold. Phillips tried to buy the gas station, which he hoped to ship to his Oklahoma estate. When Brown found out that it was Phillips who wanted to buy the building, he immediately jacked up the price. Phillips, who was known to be a cheapskate, refused to buy it. 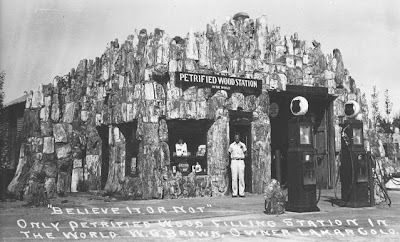 Instead, his agents surreptitiously bought 48,025 pounds of petrified wood at $1/ton and shipped the petrified wood to Oklahoma, but Phillips never built a copy of Brown’s filling station. 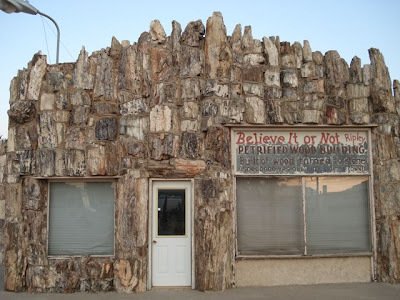 Six months after his purchase, however, Phillips did become owner of a new petrified wood building. 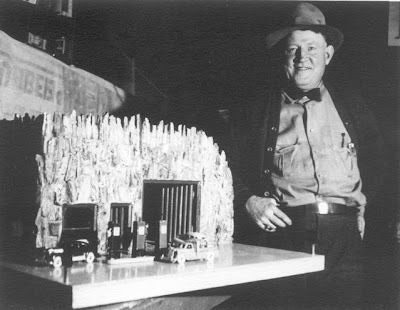 On December 2, 1939, when Phillips turned 66 at a huge bash in Oklahoma, three Lamar residents associated with Brown’s station gave Phillips a model of the station. After Phillips’ birthday, the little gas station was placed on display at his estate and was thrown out sometime in the 1950s, although no one knows exactly when.